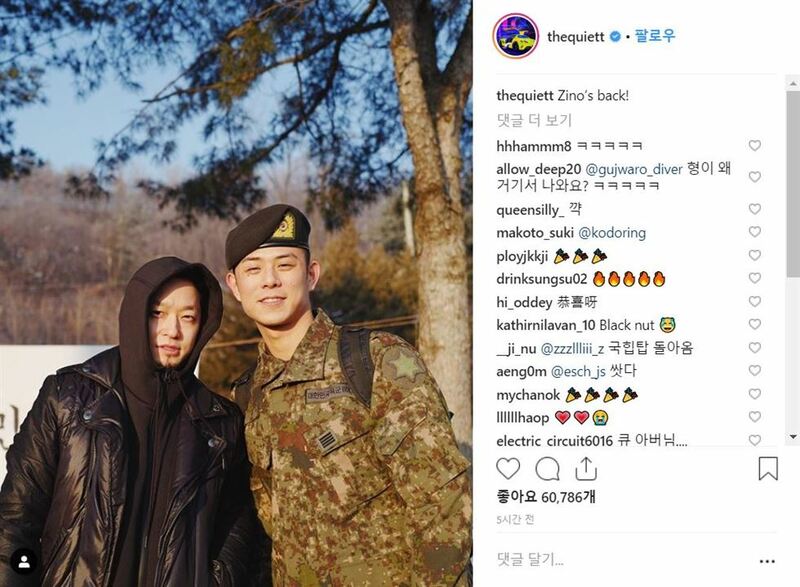 Popular rapper Beenzino has returned to the civilian world on Sunday, completing his 21-month military duty. Beenzino, 31, whose real name is Lim Sung-bin, announced his mission accomplished by posting a photo on the Instagram of himself and his German model girlfriend Stefanie Michova meeting after he walked out of his base in Cheorwon, Gangwon Province. Michova expressed her happiness by sharing a video clip capturing the moment of her hugging the long-awaited boyfriend on her Instagram account. "D-day! I got him back finally," Michova wrote. Beenzino joined the military in May 2017. All able-bodied South Korean men are obliged to serve in the military for nearly two years to defend the country from a possible North Korean invasion. He spent 21 months at a unit under the Army's 6th Infantry Division near the inter-Korean border. Beenzino made his debut in 2010 as a member of hip-hop duo Jazzyfact with DJ/producer Shimmy Twice. His hit songs include "YGGR" (2014), "Dali, Van, Picasso" (2016) and "Life in Color" (2016).